Make this Tangy Cinnamon Sweet Potato Bake as a tasty side dish for your upcoming family dinner, potluck or large holiday party gathering. As this dish is vegan, egg-free, dairy-free, oil-free, soy-free, gluten-free and nut-free, your family and guests can enjoy it without worrying about food allergies. The secret to this festive dish is the special glazing sauce combination. It has a refreshingly light taste from the fresh orange zest that pairs beautifully with sweet potatoes and complements the other dishes on the family table. Pop this dish in the oven to cook as you are making the main course meal, or make this the day before, so you have time to prep other meals on the day of the holiday gathering. Serve this Tangy Cinnamon Sweet Potato Bake either warm or cold, then freeze the extras or pack them into lunch or work boxes the rest of the week! Serve this eye catching and colorful vegan, egg-free, dairy-free, oil-free, soy-free, gluten-free and nut-free side dish to complement your next celebratory meal or bring as a crowd pleaser at the next potluck or party function. Preheat oven to 400 F (or 200 C). Wash, peel and slice up the sweet potatoes into thin round pieces. Slice the orange in half, squeeze out the juice, and then use a small fine holed grater to get the orange zest from the rinds. Prepare the glaze sauce by whisking well together the orange juice, zest, maple syrup, cinnamon and nutmeg. Using an 8 inch x 8 inch glass bakeware dish (20 cm x 20 cm), place the thin sweet potato round pieces to make a first layer covering the bottom of the bakeware dish. Then use a spoon to gently drizzle on the glazing sauce so that each sweet potato round piece gets some of the sauce. Finally sprinkle on a small handful of the dried cranberries. Place more sweet potato thin round pieces into the bakeware dish to make a second layer. Then repeat with drizzling on the glazing sauce and sprinkling some dried cranberries. If there are any sweet potato round pieces left, make a third layer and repeat with drizzling on the remaining amount of the glazing sauce and add the rest of the dried cranberries. Seal the bakeware dish firmly with aluminum foil and then bake in the oven on the middle rack for approximately 40 – 45 minutes. At the 40 minute mark, remove the dish from the oven and carefully uncover the foil cover, then pierce a sweet potato round piece with a fork or knife to see if it goes through easily. If it does, the dish is done and you can turn off the oven. If not, replace the foil cover and place the bakeware dish back into the oven to bake another 5-10 minutes, then check again. Remove the bakeware dish from the oven, uncover the aluminum foil and let the contents cool 5 minutes before serving. If you would like to add toasted pecans to the dish, then remove the bakeware dish at the 40 minute mark, uncover the foil slowly (be careful of hot steam escaping when you uncover the foil) and sprinkle on the pecans. Then bake the dish uncovered for the last 5 minutes. 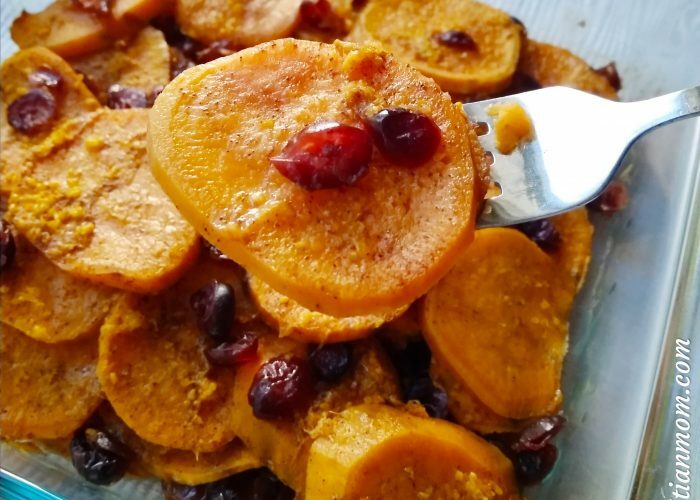 Since this Tangy Cinnamon Sweet Potato Bake is suitable to serve at the table of a holiday gathering involving those with food allergies, I have decided to enter it in a recipe contest for the Safe + Fair Food Company (www.safeandfair.com). One more thing: this is also an easy 7-ingredient, kid-friendly recipe that you can involve your children in the making. They can help to stir together the glazing sauce, make up each layer of sweet potato round pieces, drizzle on the glazing sauce and sprinkle on the dried cranberries. After all, it’s not the holidays unless all in the family get involved in the cooking right? My toddler loved the smell of this dish – even the next day when the dish was cold. I had to remind her not to get her nose too close (yes, it was almost touching the food…). So make this dish together as a family tradition and add it to your yearly repertoire of holiday dishes. Happy Thanksgiving to you all! ← Super Easy Crispy Baked Tofu!